January 2016 Scorpio Horoscope predicts that your emphasis should be more on home and home affairs and improving your emotional quotient. Improving your psychological strength will enable you to face the realities of life and professional hazards better. Scorpio, planetary power is shifting to the Western or Social sector in your birth chart. It is necessary that you improve your social capabilities as you are dependent on others to accomplish your goals in life. You should be flexible enough to face the obstacles and cannot remain adamant about your targets. The Scorpions will be engaged in a large and important business ventures in January 2016 which requires all your energies to face the nitty-gritty involved. This may drain out your vitality and affect your health. 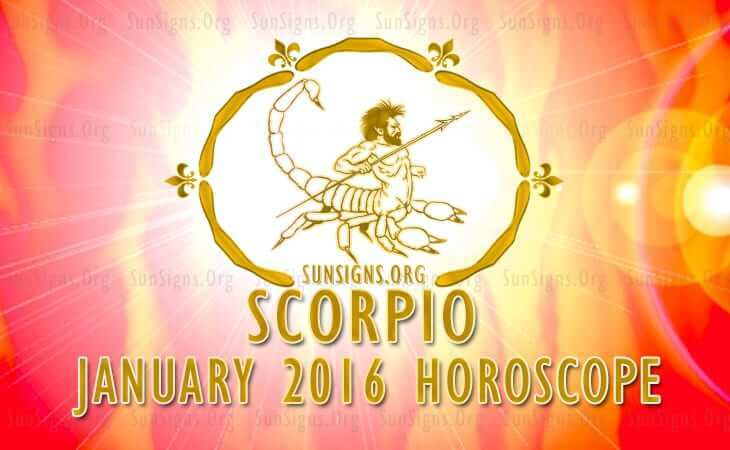 Professional and job requirements will be challenging for the Scorpio birthdays during January 2016. Businessmen will need to be patient in order to be successful in their deals. Your financial planet Mercury is in retrograde in January 2016. This is not favorable during the first week of the month. Important monetary decisions will have to be shifted to the later part of the month. Anything concerned with money will happen slowly and will test your patience. Health and domestic issues will put a strain on your fiscal health. Monetary situation will improve drastically after 20th of the month. The Scorpio monthly astrology for January 2016 foretells that you will meet people in influential positions during the first two weeks of the month and romantic life will be thrilling. Your spouse or your partner may have health problems which will require your serious attention. Unmarried Scorpio personalities will get a sudden opportunity to form a love relationship around 14th. You are looking for a partner who will further your career prospects. In partnership, you are seeking enjoyment rather than serious commitment. It is better if you don’t plan for a pregnancy this month. The 2016 January Scorpio horoscope also suggests that love is to be found in your professional circle and will be highly gratifying. If you are already in a love alliance, there will be a conflict with your mate. You should be more circumspect while getting entangled in new partnerships. Health requires a strong routine of energetic Scorpio fitness work-outs to stay in shape. After 20th, meditation is necessary keep your mind calm. To conclude, the Scorpio January 2016 monthly forecasts predict a month of delays and obstacles but nothing that cannot be overcome with your tenacity.